Welcome to the Best For Mums ultimate baby sleeping bag buyer’s guide. Here we list our favourite 0-6 month, 6-12 month and 18 month and above products for safe and cosy sleep for parents and babies. Should I be using a baby sleeping bag? How do I use a baby sleeping bag? What tog sleeping bag do I need? What ages should use sleeping bags? To save you some time reading over 7,000 words, here are our top 3 from each age range for you to consider. Sweety Fox makes sleeping bags that come in 0-6 months, 6-12 months, 12-18 months, 18-24 months and even 3-6 years so if you like this design but want to move up a size be sure to check them out. Their sleeping bags are made with 100% organic cotton. This particular one comes in 2.5 tog so it’s designed for colder temperatures or lesser layers. What we liked about this particular sleeping bag is the simplistic design and focus on safety thanks to its Oeko-tex certification. Sweety Fox gives you a lot of convenience with a great zipper making quick nappy changes a doddle. The zipper has a safe fastener to not hurt the baby. The Sweety Fox sleeping bag feels extremely soft to touch and the seams are all excellently stitched together – this bag should outlast the baby’s growth depending on the size. It’s machine washable and Sweety Fox will even give you exact instructions should you be confused. The design is very simple and should blend in with practically any interior decor. However, those who want a flashy looking slumber sack will no doubt be disappointed. The price point for Sweety Fox’s sleeping bag is very good. and should be suitable even if you’re on a budget. It’s back by only positive reviews on Amazon and quite often it’s on offer if you’re after a bargain. We can’t fault this sleeping bag for parents of babies 0-6 months looking for their first ever sleeping sack. It’s safe, well made, soft and good looking. There’s nothing not to like here. Like we mentioned earlier, if you’re keen on this and want a different size just follow the link and make your selection of three different styles! 2️⃣ MADE OF 100% ORGANIC COTTON, FREE OF CHEMICALS - The outer and inner layers of these comfortable sleeping bags are made entirely of organic cotton jersey for unbelievable softness (with 100% polyester padding), and all our unisex baby sleeping bags are guaranteed free of traces of chemical products, by independent label OEKO-TEX: Give your baby the very best. The Gro Bag Roll Up sleeping bag is one of the most widely reviewed 0-6 month sleeping bag on the UK market. They are a multi-award winning household name who make quality products which are BS8510:2009 approved and an intense focus on comfort and usability for both parent and baby. Reviewing baby products can be a bit tedious at times because they are so regulated they’re not allowed to be that different quite frankly but these guys go the extra mile with the number of extras you get with purchase. You get two in a pack. There are double shoulder poppers and zips on both sides which makes it simple to put on and secure once it’s on your baby. The zips use zip clicks so they can’t be opened accidentally (or on purpose for larger sizes). For the 0-6 month size, there are underarm poppers to compensate for the fiddliness being smaller brings. The material is 100% cotton jersey which is soft to touch and machine washable. 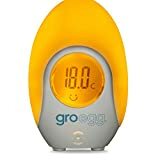 We mention extensively in the buyer’s guide that the key to picking the right tog is the temperature of the room so you might be pleasantly surprised to find a Gro Bag Roll Up 1.0 tog 0-6 month sleeping bag comes with a free nursery thermometer. Get this sleeping bag if you’re after a tried and tested product and tend to go for mainstream brands. The added thermometer and the fact it comes in a two pack is a major sweetener. Don’t forget that if you want a higher or lower tog or a different size they also cater for that. Available sizes: 0-6 months, 6-18 months, 18-36 months. The Gro Company’s offering in the 0-6 month segment is a top quality sack which is another multi-award winner and the only sleeping bag approved the Lullaby Trust and of course the EN16781:2018 standard. The shoulders have poppers and on the sides are YKK zips for safety and ease of use. Perhaps the most striking feature of this sleeping bag and why you might want to consider it are the bright colours and vibrant patterns you can get. We’ve only shown one pattern here but if you clicked through the view the product you’d see other ones available. The Gro Company offer sleeping bags with front zips and side zips (both YKK zips) which are secure zip clicks and practically impossible for the baby to take off whether it is by accident or on purpose. Go Company’s products are well priced and well marketed making them a fairly mainstream and well-tested product. You’ll find hundreds of positive reviews like ours online so be rest assured that this is a reliable product and safe for your baby to use. All we can say is if the pattern takes your fancy then why not check this out. A slightly different approach to the sleeping bags we’ve reviewed so far is the Snuz Pouch which works more or less the same but there is a different front opening – this helps in two ways – this allows easy access to change the nappy with little to no disruption to the baby and the other is to allow the baby to be cooled down in a hot night. This sleeping bag is still oeko-tex certified, conforms to BS 8510:2009 and is made using 100% organic wool and has safety zips and poppers on the shoulders. Clearly, in such a competitive market which is heavily regulated, every company had to make the effort to create their own USP and Snuz have gone for this opening. And do you know what? It’s a really, really handy one too. If you have a baby that dream poops then this may be the best baby sleeping bag for you. It’s relatively new, so there isn’t a massive amount of existing third-party feedback but there is some and it’s all positive. The Snooze Bag 2.5 tog 0-6 month sleeping bag for babies is our final entry in the 0-6 month category and it’s because this is one of the cheaper sleeping bags for babies on the UK market as well as one that’s got a front zipper for a bit of a change from the others. It’s made using the very same 100% organic jersey cotton for comfort. This one is geared towards boys but perfectly suitable for girls in this day and age. Despite being a somewhat budget offering this is still a product which is compliant with British standard BS 8510:2009, has double front YKK zips for safety front and back. We feel the reason why Snooze bags are particularly good value is that they’ve doubled down on making them only 2.5 tog which is the most common rating. This is a fantastic entry level sleeping bag for those who just want one that’s all year round with a simple style and a low price. The front zipper is a personal choice. Backed by a large amount of very positive reviews this bag is unlikely to disappoint. No bonuses will come with this like the others but they do make a sleeping bag for 3-6 year old toddlers if you fancied that. Sizes Available: 0-6 months, 6-18 months, 18-36 months and 3-6 years. SIZE 0-6 MONTHS -SNOOZEBAG LENGTH :76cm (Min Child Weight:8.8lbs/4kgs - Max Child Length: 68cm / 27"). NEW IMPROVED ZIP!!! EASY NIGHT TIME CHANGES: Double Front YKK zip on all sizes with Reverse YKK zip for easy night time changes. The following selection of sleeping bags are ideal for babies from 6 months to a maximum of 18 months. The Mamas and Papas Dreampod is one the better products in the 6-18 month category and is pretty much the same quality sleeping bag as the 0-6 month one just bigger. It’s got front facing zips if that’s something you’ve been used to so far or if you want to try a different type. Mamas and Papas do all of their Dreampod line of snooze sacks in neutral colours if that’s the kind of thing you’re into but if you’re after something a bit flashier then you’re going to be disappointed. You will get two sleeping bags with a purchase which is fantastic and perhaps a lot of people don’t realise that if there’s been an accident and it needs to be washed then your baby will be without a sleeping bag for a night. Having two gives you an extra buffer. We had to do some digging but we can confirm that this is BS 8510:2009 compliant. However, there is no word from oeko-tex or the lullaby trust. However, it is a safe product to use so don’t worry. Overall, we love the simple neutral style and we have found that front zips are superior in terms of convenience. If you want a good deal from a mainstream brand on your next size up sleeping bag for a baby then this is the one for you. The Jojo Maman Bebe Baby Cosy, 3.5 tog 6-18 months is a sumptuous sleeping bag designed for colder nights with it being 3.5 tog. It’s extra wadding and superior materials make it one of the softest sleeping bags we’ve encountered, which is a good thing considering the price tag! Jojo Maman Bebe are not known for being the cheapest but they do have a reputation for being one of the best websites to get better than average baby products and their branded product is no different. They do have other styles available but this was our favourite of the bunch. Its design uses a safety YKK zip that goes down the middle for convenience putting it on, taking it off and getting access just to change a nappy. Perhaps the feature we all agreed was fab over here at BFM HQ was the detachable sleeves to make it even more snug or cooler if you were to use it in higher temperatures. It goes without saying the Jojo Maman Bebe Baby Cosy, 3.5 tog 6-18 months sleeping bag conforms with BS 8510:2009 and is perfectly safe to use. There are two colours available – fuschia and navy for a boy or a girl. The Gro Company Velour Sleeping Bag, 3.5 tog 6-18 months is one of the best looking premium sleeping bags on the market, we think. This is the same multi award-winning brand who are the only ones to be Lullaby Trust approved on top of EN safety standard EN16781:2018. This is an ideal sleeping bag for those living in colder climates or for people who want to go camping with their baby as 3.5 tog is a bit high to be classed as an all year rounder. It uses shoulder poppers and side YKK safety zips. It’s USP over the other bags, including the other ones made by Gro Company is the velour feel on the outside. Specifically, the sleeping bag is made with 80% Cotton & 20% Polyester outer; 100% Cotton lining; 100% Polyester wadding. This leads to a softness unrivalled but it’s pretty much for the benefit of the parent as the inside is the same as all other sleeping bags. All in all, we think this is a really fab sleeping bag which looks fantastic, feels fantastic and keeps your baby dead cosy. As a bonus, you will also get a nursery thermometer! The Slumbersac 2.5 tog, 6-18 months sleeping bag is a premium quality sleeping bag for babies between 6 and 18 months at a budget price. Although the image doesn’t show it, it’s a sack which has a middle zip but with a protective anti tampering cover. Also includes the standard shoulder poppers. The biggest bonus with choosing to go with Slumbersac is that there are a LOT of different patterns to choose from, not just the choo choo style we’ve shown here. If you’ve looked at the sleeping bags we’ve shown so far but it’s the pattern you’re not keen on then click the link to see if any of the others these guys offer are to your taste. This bag complies with European safety standards and comes in 2.5 tog which is ‘all year round’ rating. Made using 100% cotton and 100% polyester padding this product is soft to touch and really snug on the inside. This bag also has the distinction of winning the Mumsnet Best award which isn’t a common accolade to have. This is a brilliant product entry and one we’ve been very pleased with so far. In a world of products with very little difference between them, we’re glad to see some manufacturers offer some colour. Our final entry in the 6-18 month category is the Silentnight Safe Nights 2.5 tog, 6-18 months sleeping bag. This one has our vote for being the best sleeping bag on a budget that will still the job for you in giving your baby a cosy and safe night’s sleep. It’s sleeveless with a front zipper making it a bit cooler for the baby and easier for mum or dad to get in to change a nappy as well as making it quicker to get on in the first place. If you’re wondering if it’s made by the same UK company that makes the mattresses and often on the telly then yes it is! And who better to help you get a good night’s sleep than them. There are three patterns available as you can see from the picture and they’re all fairly neutral with two which could be boy or girl specific if that’s what you’re after. It may be a budget option but it’s not a poor product. However, it’s definitely not the most robust either and many have commented on the pattern losing it’s colour from repeated washes (50+) and others saying it started to shrink. We reached out to Silentnight about this who mentioned that if the washing instructions are followed this should not happen so make sure to find these before you throw it in the machine. This sleeping bag conforms with safety standards and is a multi award winning product highlight value for money rather than quality. We would recommend these for those who need a sleeping bag but have a tight budget – however, if you can afford it we would point you in the direction of other products, to be honest. Here is a small selection of recommended sleeping bag for babies 18 months old to 36 months old. If you’ve been reading the whole article then you probably noticed that this sleeping bag has featured before but in a different size. We want to keep it varied but keeping it varied for varied sake means we aren’t actually recommending the ones we believe are the best. The Gro Company Velour Sleeping Bag, 3.5 tog we feel is one of the best sleeping bags regardless of the size so we’ve decided to showcase it again. A simply superb product which is exceptionally soft and has passed all of the safety tests you can throw at it. Despite 3.5 tog being 1.0 higher than the all-weather one we just felt that if you wanted a baby to be cosy during the colder months and when camping/travelling then this really is it. As the only one given the nod by the Lullaby Trust it’s hard to look past this one if your top priority is safe sleeping. Top quality stitching, safe and secure YKK zips and easy access on the side make it convenient, too. It’s not cheap, mind, with full price being mid £40s and offer price being low £30s and you only get one in a pack. You will get a free nursery thermometer, though, which is a much welcome bonus if you haven’t got one. All in all, if you want a bigger bag for your 18-36 month baby and don’t mind paying the extra for an approved bag which looks and feels great then this is it. A second entry from the fabulous Gro company is their fantastic 3.5 tog winter warmer sleeping bag which features a super cute penguin design. We’ve chosen this one and the Gro company again as the sleeping bags are multi-award winning (Made for Mums) and has a reasonable price point half way between being cheap and being expensive making it accessible for most people. The quality of the sleeping bag is simply faultless and you can tell that the 100% cotton they use is top notch and the stitching is not going to let you down. It’s compliant with European standards and uses YKK safety zips. It’s sleeveless which can help cool your baby down if it’s a little too hot (3.5 tog is a bit higher than average). It’s very easy and quick to get the sleeping bag on and it’s the same story to take it off. Midnight nappy changes are also a doddle making this a very convenient solution to getting your baby (and you) a peaceful and safe night’s sleep. Comes with a full user guide and washing instructions. To put it simply, if you are looking for a mid-range 18-36 month sleeping bag that’s got a neutral, cute pattern then this is the one for you. The Slumbersac Sleeping Bag with feet, 2.5 tog is a 24-36 month as opposed to 18-36 months but we wanted to add it here as it’s one of the fewer options which have feet as opposed to a bag. Does this make it more of a baby grow than a sleeping bag? Perhaps, but its purpose remains the same as do the materials used and so on. 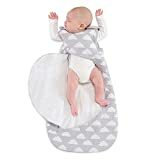 The angle of this quirky sleeping sack is that babies are able to run around while still in which can make it great for winding down at night or to get going in the morning. For this reason, having feet on a sleeping bag can be really useful for this age bracket but perhaps not for younger babies. The patterns we’ve shown is of some cute owls but there are other available if you click the link. Despite the different design, this is an incredibly soft sleeping bag that feels the same as the others with a bag design. It’s made using 100% organic cotton and it’s padded to keep your babe warm. This is a sleeping bag a lot of parents have commented on the fact that your toddler can’t escape from it or open it by accident in the middle of a sleep. It’s safe and secure which conforms to European safety standards and utilises YKK zips. We love the extra mobility it allows babies but we probably wouldn’t recommend this product to children under the age of 18 months as the legs give them more mobility than we would like! 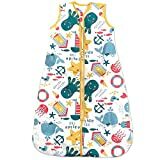 This giant sleeping bag by Jojo Maman Bebe is a right treat for those wanting to get a long-lasting, quality sleeping bag which can be used for a good couple of years and then some. As you can see from the name, this sleeping bag goes all the way up to 4 years old so it’s quite an investment. Although designed for toddlers this bag still complies with BS 8510:2009 and is exceptionally safe to use. The one we’ve highlighted here is a 4.5 tog version and therefore suitable pretty much all year round but maybe not for particularly got days. It has a front zip opening, wadding for extra warmth and made using 100% organic cotton. The snazzy design is what catches a lot of people’s eye and we feel this does play a big part for this age group who may be more interested in wearing ‘fun’ clothes. It’s extra long as you can see but it can be tucked in for smaller toddlers until they can fill it out. Specifically, adjusts from 92-107cm long so measure your child in advance to see if this is suitable right now. Overall, this is the second product we’ve featured from Jojo Maman Bebe and in fact this is the most popular product on their website with over 120 positive reviews from real customers. If you want a great toddler sleeping bag then we highly recommend checking this one out. Our last entry in our 18-36 months sleeping bag is the Kaboosh Seaside Fun, 2.5 tog, 18-36 months sleeping bag. A relatively less known brand that isn’t Gro Bag, Gro Company, Slumbersac or the other titans in the industry. 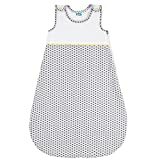 This is a sleeveless sleeping bag with a funky design and sizes going all the way up to 6 years. Give yourself and your baby a longer, safer sleeping with this bag which conforms to all the safety guidelines and provides an all weather 2.5 tog solution. The USP of this is that it’s definitely one of the cheaper alternatives even when it’s not on offer and an added bonus of a nursery thermometer if you haven’t got one. Kiddy Kaboosh’s designs are some of the brightest and most colourful which can make bedtime a little more fun for the baby especially if they’re older and start to care about designs. Other than that, this sleeping bag doesn’t reinvent the wheel but it does provide stiff competition to the other brands which dominate the market. We feel the price paid will get you the same product as the other brands and it might be a good idea to get them while they’re cheap as if they start becoming more popular then the price will no doubt go up. Welcome to the Best For Mums baby sleeping bag buyer’s guide. In this section, we break down everything you need to know about buying sleeping bag for your baby including the differences between products and brands, pros and cons of a sleeping bag to help you decide which one you should buy or whether you should buy one at all. All Best For Mums reviews are impartial and simply the opinion of our testers and writers – always do your own independent research and do what feels right for you and your baby. A baby sleeping bag is pretty much the same thing as an adult sleeping bag is, but instead of being used for sleepovers and camping trips a baby sleeping bag is used for naps and nighttime sleep. A newborn baby sleeping bag is constructed in a way that it can be seen as a wearable duvet/quilt or even a dress in some cases. Most sleeping bags are made more or less the same to work like a sack with sealed sides and straps which go over the shoulders so it can’t be accidentally taken off with sleepy time wriggling. The biggest differences between brands of sleeping bags are the patterns, sizes, entry method and the tog measurement. A baby sleeping bag is not an essential baby purchase but the benefirs far outweigh the drawbacks, we feel, and if it can fit within the budget we believe every parent should have one in the home. Although we are big fans of baby grow bags, we know that they are more of a luxury item than a necessity. They’re not something you ‘need’ and if you’re a family on a tight budget we would probably recommend you spend your money elsewhere. That being said, a newborn sleeping bag is on the recommended list of products from the Lullaby Trust, a charity created to raise awareness of SIDS and is a product which provides a lot of conveniences and can make bedtime much simpler, especially in summer and winter. To counter that, Which? conducted a survey which found many sleeping bags to not be ‘safe’ leaving many parents anxious about buying one at all. Don’t worry, we won’t be mentioning any of these! If you strive to have the absolute safest sleep possible for your baby then a sleeping sack which has been thoroughly tested to British standards can definitely help with that, it can also prevent babies kicking their covers away or accidentally having covers put on them as they move about. Our advice is to read up on a buying guide such as this one to make sure you are getting the right one for you and your baby’s needs. To make it easier for you to determine whether or not a baby sleeping bag is for you we’ve curated a list of benefits and drawbacks from many other sources alongside our own to help you out. For most mums, especially if you’re baby is younger than 6 months or breastfed then bedtimes can be a source of frustration. If you’re not using a baby sleeping bag then preparing your baby’s clothes and sleeping area can be fiddly with several steps before they finally get their head down. Using a baby sleeping bag removes a few steps which allow you to get them prepared quicker and easier. There are no sheets or layers to contend with, either. Just put your baby in the sleeping sack, secure them and place them in the cot. There are a few things which let the baby know it’s time for bed – the lights go off, perhaps a sleep-aiding toy comes out to play and a special type of milk is prepared. Putting on a sleeping bag can be used as another icon of a great night’s sleep for your baby. When you put it on they can start to associate it with a great rest and it may get them in the mood quicker as a result as they feel secure and comfortable in the familiarity of the baby sleeping bag. If you think baby sleeping bags are just for winter then think again. Most baby sleeping bag brands in the UK make versions with different togs (more on tog later) to suit different seasons. Effectively, a sleeping bag for a baby can be used in the summer and it will keep their temperature the same as a higher tog baby sleeping bag for the winter. Obviously, this means you’ll need to fork out on more than one, though. There are also other differences between summer and winter baby sleeping bags other than the tog with some baby sleeping bags having arms and others not covering the legs. Most sleeping bags, especially the ones that we recommend, will have zips or easy clips to allow you to get it on your baby in the first place and to be able to get in and out of the sleeping bag for nappy changes and so on. It’s also very hard if not impossible for your baby to get out of on their own so you don’t need to worry about your baby slipping out and being uncovered in the middle of the night – this feature also makes the baby sleeping bag much safer than using covers which can lower the risk of SIDS as we’ve previously mentioned. Baby sleeping bags are more expensive than the product they’re replacing, generally. By that, we mean they are more expensive than using covers. They’re actually pretty expensive in general as well so those on a budget who simply can’t get everything on their wish list may need to reconsider this one. Babies grow quickly and they will outgrow their slumbering bags. Sizes of sleeping bags come in ranges of 0-6 months, 6-12 months, 12-18 months and 18 to 36 months so that’s 4 different bags you’ll need to get before they become toddlers. We previously mentioned how they’re more expensive and this is yet another reason on top. Not only will you need up to 4 different sizes but you’ll also need more than one depending on the season due to the differing togs. That’s unless you opt to not use a sleeping bag in the winter or summer and use a different sleeping product for those seasons. Because it’s an item of clothing it can become dirty from general use or soiled by the baby itself. Once it’s dirty and/or in the wash it’s out of action and you’ll need to use an alternative sleeping arrangement. If your baby really loves sleeping bags and you haven’t got a spare this could cause some problems for you and your baba. If you were expecting a really complicated guide then fear not! A sleeping bag or a sack is a dead easy product to use – you just put your baby in and zip them up, or button the shoulders and that’s it. Perhaps an easier way to demonstrate is via the Grobag company’s instruction video whom we recommend. Here are some key features of baby sleeping bags we feel you need to consider before buying the best baby sleeping bags. If the brand of sleeping bag you’re considering has not stated that what you’re buying conforms to this then don’t buy it. You won’t know definitely know how good a baby sleeping bag will fit until you’ve purchased it and tried it on. To be fair, it’s very hard for most manufacturers of baby clothing and apparel to get it right with every one of their sizes. My son, for example, could fit in 6-9 month clothing at the age of 4-5 months – when it was us buying the clothes it was easy but it is a nightmare for relatives and friends when they buy clothing as gifts. What you should look for are sleeping bags with extra poppers which allow you to adjust to fit the size of your baby snugly. Your baby should not be able to get their hands into the bag and potentially stuck in the night. The neck area should have plenty of play but not so much that they can duck their head into the bag, but not so much that it’s tight and inhibits the head’s natural movement. 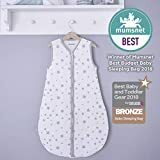 Another fantastic way to ensure your purchase will be a great fit is by making sure you get a sleeping bag that’s a good fit is the feedback and reviews left on third party sites that sell them such as Jojo Maman Bebe and Amazon. If your baby’s sizing seems spot on with baby grows and sleep suits then they will no doubt fit fine in the size guides of the sleeping bags. If you have a large or small baby for their age then go fown or up as appropriate. We say this in every product roundup guide we’ve created on Best For Mums. Never just take our word for it! Our experience of these products do not necessarily reflect what you’re likely to experience yourself which is why we recommend to always check out what others have said before committing. Websites like Amazon and Jojo Maman Bebe collect reviews on their products so be sure to check them out. When viewing the product on whatever website you find yourself on, make sure the features of the sleeping bag are clearly defined and none are missing. You’re looking for things such as – is it machine washable, does it use zips or poppers? Is it compliant with British standards and additional standard such as Oeko-Tek? What tog is the product? What material is the entire thing made out of? Some manufacturers can write a load of fluff on their sites to make their product look amazing but it’s these critical features that make a sleeping bag great and if they’re not clearly shown then you should avoid. If you’re not in the know about what tog means then allow me to explain before we get into what tog a sleeping is depending on your needs. A tog is a unit of measurement for the thermal resistance of a given area. Think of tog as a rating to match a given temperature. A tog ‘rating’ is between 0.5 and 2.5. The lower the tog the less dense the material and insulated the sleeping bag is. In the summer you will need a lower tog and in the winter you will need a higher tog. However, a tog should match the temperature in the room and NOT the season. If you’ve got air conditioning, climate control or a home temperature control unit such as Hive then you can use the same tog sleeping bag all year round. However, if you don’t have any of these things and the nursery or the room your baby sleeps in is affected by the rising or declining temperatures outside then the tog of the sleeping bag is important. The first step in understanding what tog the sleeping bag should be is to find out the temperature of the nursery your baby is going to be in is. If you don’t have one we recommending investing in a simple room thermometer. 0.5 Tog – 0.5 tog sleeping bags are the lightest sleeping bags you can get and should only really be needed in high summer in bedrooms and nurseries where the temperature could reach and possibly exceed 24/25 degrees. Ideally, if the rooms reach these temperatures please try and lower them if possible because if they keep rising you shouldn’t be using the sleeping bags at all as it’ll become too hot. For more people, 0.5 tog sleeping bags are for summer. 1 tog – A 1 tog sleeping bag is ideal for houses which get warm between 22-24 degrees. Like the tog chart shows, layers can be removed from the baby to adapt the 1 tog sleeping bag accordingly. 1.5 tog – We would say that a 1.5 tog sleeping bag is the most common tog fora bag which is suitable for room temperatures of around 19-21 degrees which is roughly the optimal temperature a bedroom or nursery should be. Think of 1.5 tog sleeping bag as the all-rounder, suitable all year round with some extra layers in winter and just a vest in the summer. 2.5 tog – This is a tog for winter or houses with poor insulation or a lack of heating at any time during the year, or for those who live in generally colder areas such as Scotland. We’re talking sub-18-degree temperatures at any given time in the bedroom or nursery. If the temperature drops even further than you’ll still need to any some extra layers under the sleeping bag. If the temperature is even less than 16 degrees then you will need more than a sleeping bag to keep them warm. Babies, children and toddlers can all use sleeping bags and can provide warm and safe comfort. However, the safety benefits of the sleeping bags are better used by young babies who are not able to regulate their body temperatures and are at risk of being smother by other layers. This means that although the benefits are can be enjoyed by children of any age it is babies who really benefit the most. We would also add that if you use baby sleeping bags shortly after birth then this can make them used to the products and therefore more likely to enjoy the consistency of continued use after. Going back to the question, the age which babies should be using sleeping bags for SAFETY the most, in our opinion, is between 0-6 months and then after that it becomes more about familiarity and comfort. For our closing comments, we remind you that babies are not able to regulate their own temperature which is why there is this focus on room temperature, layers and togs. Find out the temperature of the babies nursery or bedroom BEFORE committing to a particular tog sleeping bag. If you have a thermometer in the room then understanding what tog and how many layers they need is easy peasy.